When people talk about the city of madurai,the one place which overshadows allthe other is the much revered meenakshi temple.But there are many other temples in and around Madurai that are visited by tourists. One such temple is Alagarkoil. The term Alagarkoil actually means Alagar Temple. Alagarkoil is located at a distance of about 21 km to the east of Madurai at the foot of the Alagar hills. According to history, Malayadvaja Paandian was the first patron of this temple. He was the son of Kulaseekara Paandian, the founder of the city of Madurai. Jaatavarman Sundara Paandian, ruler of Madurai in the period 1251-1270 is credited with gold plating the tower of the sanctum of Alagarkoil. The Naayakaa kings were great patrons of art and architecture. Alagarkoil was also highly patronized by them. The presiding deity of Alagarkoil is Lord Vishnu. His stone idol is referred to as Kallalgar. There is a very interesting story in Hindu Mythology that is related to him. It is believed that Lord Vishnu visits Madurai in the human form of Alagar to get his sister Meenakshi married to Sundareswarar. He crosses the River Vaigai in a golden horse and this spectacular procession is attended by a large number of people with joyous enthusiasm each year. According to the Mahabharata, Alagarkoil was visited both by Yudhistira and Arjuna. Statues of Kallalagar in different poses are to be found at Alagarkoil, Madurai . He is seen in seated, standing and reclining postures. Local inhabitants also refer to him as Soundarajan or beautiful king. There is a shrine within the premises of the Alagarkoil dedicated to Karuppa Swamy. There are a total of 11 Mandapams or halls within the fortified walls of the Alagarkoil in Madurai . There are many ornamented pillars within the halls. They are rich in decorative details. 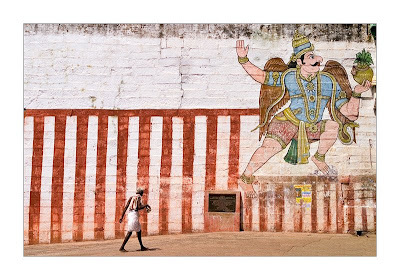 It is rather unfortunate that mural paintings presently exist in only one of the Mandapams. These wall paintings in the Vasanta Mandapam are indeed very impressive. They depict scenes from the Ramayana. The yali or an imaginary lion like beast representing human passions that is to be sighted at the Alagarkoil temple Madurai exhibits intertwining trunks and is much akin to the one that is to be found at the Meenakshi temple.